Bruised rib is a discoloration of the skin that may indicate a crack or break in one of the bones usually resulted by a strong force, such as falls, motor vehicle accidents, or a hit with a blunt object. In older people, however, only a slight force (such as a minor fall) is sufficient. This is more likely to happen if you have a disease that has made your bones weak, such as osteoporosis or cancer. Bruised ribs may also result due to severe chronic coughing. Bruised ribs are different from broken or cracked ribs in a way that in broken ribs, the injury is directly inflicted upon the bone while in bruised rib; the surrounding muscle area is affected. The fracture is rarely serious, although internal organs, such as the lung, liver, or spleen are occasionally damaged by the force that caused it to fracture. The likelihood of people that may have damaged their internal organs depends on the ribs that are injured. Leukemia – The easy bruising can be caused by a low platelet count, and leukemia patients have this and a high white blood cell count. Aplastic Anemia – A bone marrow disorder resulting failure to produce sufficient platelets that increases the risk of bleeding and bruising. Von Willebrand’s Disease – A condition that involves extended or excessive bleeding and bruising. Ehlers-Danlos Syndrome – A group of inherited disorders marked by extremely loose joints, hyperelastic skin that bruises easily, and easily damaged blood vessels. Steroid usage causes skin thinning resulting and easy bruising. Chronic coughing can lead to putting a lot of pressure on the ribs and cause bruises as well as fractures. Anteroposterior (AP) and lateral chest films are used routinely to assist in the diagnosis of rib injuries. Delayed or follow-up radiographs can be very helpful. Through this, the doctor may be able to rule out rib fracture. 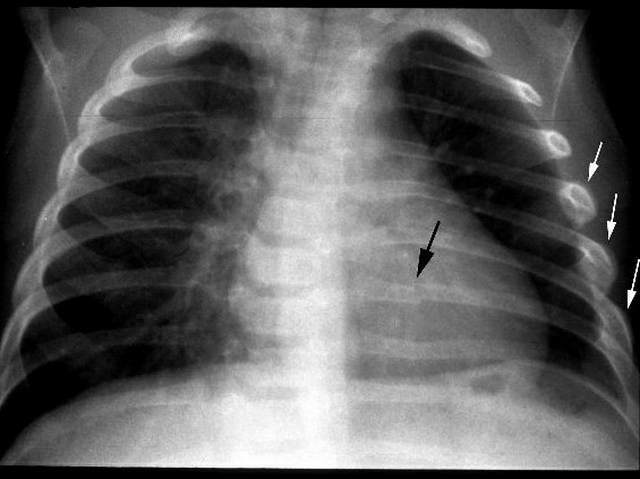 Chest radiographs are much more useful in the diagnosis of underlying injuries, including hemothorax, pneumothorax, lung contusion, atelectasis, pneumonia, and vascular injuries. Chest CT scan has shown to be more sensitive than plain radiographs for rib fracture detection. This can also determine the number of ribs involved. If complications in respect to rib fractures are considered clinically or diagnosed by plain radiographs, a chest CT scan may be expedient to document specific injuries, to characterize coverage of injury, and to plan for definitive management. An associated CT scan of the abdomen with intravenous contrast should be taken into account in cases involving lower rib fractures with suspected or known injury to the liver and/or the spleen. Angiography. Because first and second rib fractures are likely associated with vascular injury, angiography is worth considering for such patients. Urinalysis. Obtaining urinalysis in cases of lower rib injury as hematuria may indicate renal injury. Arterial blood gas (ABG). Tests of the pulmonary function are used to determine if the lungs have been contused but do not actually test for rib fractures. Complete blood count (CBC). A CBC count is a customary laboratory test for most trauma patients. The CBC helps determine the loss of blood, although the accuracy of findings to help determine acute blood loss is not entirely reliable. Other important information provided includes platelet and white blood cell counts, with or without differential. Rest: Typical healing time for bruised ribs is between 3 to 6 weeks. It is important that you prevent them from any further damage once you are diagnosed having bruised ribs. Cold compresses: Apply for 20 minutes at a time, 2 to 3 times per day. Deep breathing exercises: A spirometer helps stimulate deep breathing for tissue perfusion and to decrease the risk of pneumonia. Narcotic pain medication: For moderate to severe pain for short term use only.